DIRECTIONS: Get to Hutchinson and travel West on Highway 7 for 8 miles. Turn RIGHT onto Highway 22. Go 1/4 mile and take the first LEFT on 140th Street. Drive 100 feet and the Gun Club will be on your LEFT. Park anywhere near the clubhouse. HOURS: Class begins at 8am and is usually done around 2pm. COST: $85 for individuals. The price covers the training and lunch plus all students will receive a one year membership to the Cedar Mills Gun Club. DISCOUNTS: Current Cedar Mills Gun Club members get a $35 discount. Married couple recieve a discount and there are other discounts available - please ask for more details! PAYMENT: Cash or Checks only. YOU NEED TO BRING: a PISTOL (Semi Autos with 2 magazines are preferred - but Revolvers may also be used), at least 50 ROUNDS OF AMMO - Glasses and Hearing Protection will be available. Dress for the weather! UPON SUCCESSFULLY COMPLETING THE CLASS: you will receive a training certificate that you need to take to your local sheriff's office to apply for the permit. AUGUST: - to be announced - please let us know if you would like to sign up or be notified. SEPTEMBER: - to be announced - please let us know if you would like to sign up or be notified. OCTOBER: - to be announced - please let us know if you would like to sign up or be notified. NOVEMBER: - to be announced - please let us know if you would like to sign up or be notified. DECEMBER: - No classes planned - HAPPY HOLIDAYS! JANUARY: - to be announced - please let us know if you would like to sign up or be notified. FEBRUARY: - to be announced - please let us know if you would like to sign up or be notified. MARCH: - to be announced - please let us know if you would like to sign up or be notified. APRIL: - to be announced - please let us know if you would like to sign up or be notified. MAY: - to be announced - please let us know if you would like to sign up or be notified. *If you have a group of 8 or more, the instructors are available for a private class. Contact us for more information or to set a date. LUNCH - food and beverages will be provided. RANGE TIME - this is to show you can safely and competently handle a loaded firearm. - Fire 10 rounds from 2 magazines - shoot 5 rounds, remove magazine, insert second magazine and fire 5 more rounds. - *REVOLVERS: Fire 5 rounds, reload and fire 5 more rounds. WRAP UP - Testing, going over answers, paperwork and dismissal. 5. After taking this class - you have to take the training certificate we give you to your local sheriff's office and apply for a permit. 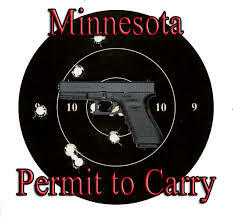 *Minnesota residents must reside in the county from which they are requesting a permit. 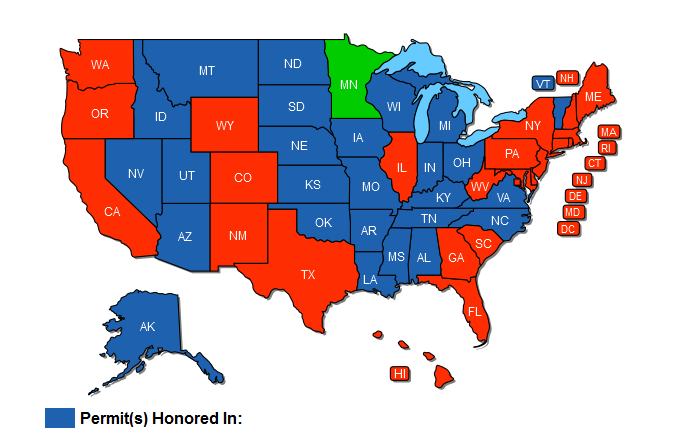 Non-residents may apply to any Minnesota county sheriff. 6. 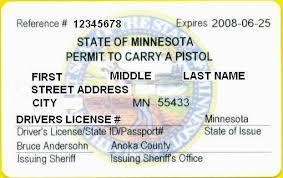 The Sheriff has 30 days to complete the application and will mail your permit out once you have been approved.